As Evelynne Lowry, the daughter of a copper baron, comes of age in early 20th century Montana, the lives of horses dovetail with the lives of people and her own quest for womanhood becomes inextricably intertwined with the future of two men who face nearly insurmountable losses--a lonely steer wrestler named Zion from the Montana highline, and a Cheyenne team roper named William Black Kettle, the descendant of peace chiefs. An epic that runs from the Sand Creek Massacre of 1864 to the ore and industry of the 1930s, American Copper is a novel not only about America's hidden desire for regeneration through violence but about the ultimate cost of forgiveness and the demands of atonement. It also explores the genocidal colonization of the Cheyenne, the rise of big copper, and the unrelenting ascent of dominant culture. Evelynne's story is a poignant elegy to horses, cowboys both native and euro-american, the stubbornness of racism, and the entanglements of modern humanity during the first half of the twentieth century. Set against the wide plains and soaring mountainscapes of Montana, this is the American West re-envisioned, imbued with unconditional violence, but also sweet, sweet love. Shann Ray grew up in Montana, played college basketball at Montana State University and Pepperdine University and professional basketball in Germany. Among other places, his work has appeared in the Best New Poets and The Better of McSweeney's anthologies, and been selected as notable in the Best American Nonrequired Reading and Best of the West, and as a finalist for the Western Writers of America Spur Award. He now lives with his wife and three daughters in Spokane, Washington where he teaches leadership and forgiveness studies at Gonzaga University. 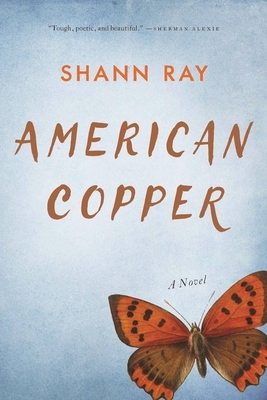 American Copper is his debut novel. Ray's first book, a story collection entitled American Masculine, published by Graywolf as Winner of the Bread Loaf Writers' Conference Bakeless Prize, was named by Esquire as one of Three Books Every Man Should Read, and selected by Kirkus as a Best Book, Best Short Story Collection, and Editor's Choice selection. It won an American Book Award, the High Plains Book Award for Best First Book and Best Short Story Collection. The author received an NEA Fellowship in Creative Writing in 2012.